Maple Syrup Products: What Is Maple Sugar? For as long as there have been people on the earth, there have also been sweet tooth cravings. People have been sweetening foods and making some sort of desserts or candy for eons long before cane sugar was a part of their lives. How did people sweeten things before sugar came along? By using maple syrup, of course. Maple syrup is completely natural and organic and has been around for ages. Native Americans and pioneers tapped the sugar maple trees every year for the sap that would be boiled down into maple syrup to use. One of the products made from maple syrup was maple sugar. 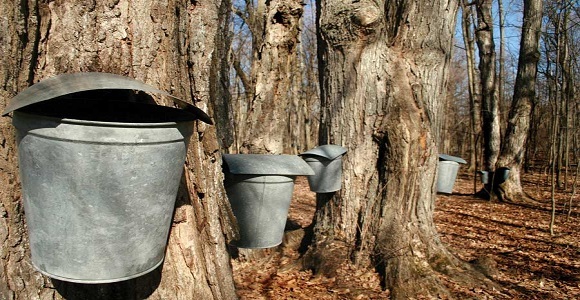 Maple sugar is made when the sap from the sugar maple trees is boiled and boiled for a longer period of time than it takes to make regular maple syrup. When nearly all of the water has been boiled away, the remnants left are a solid sugar. This is maple sugar. Native Americans used it specifically because it was easily transported in blocks or candy form and brought no worries of spoiling, as it lasted a long time. These days, maple sugar is sold in pressed blocks or translucent candy forms and can be used in many ways, just like the Native Americans and pioneers did. When used in the place of regular granulated sugar, granulated maple sugar is about twice as sweet but actually has fewer calories. This makes maple sugar an ideal substitute for regular granulated and/or cane sugar. Diabetics have to watch their intake of sugar carefully for health reasons and maple sugar is an ideal sweetener for them. Because maple sugar is simply maple syrup with the liquid boiled away, it also has a low glycemic index and is therefore a better sweetener choice for those who suffer with complications from diabetes. Maple sugar was often a big treat back in the pioneer days. When the sap would begin to run and the tree tapping began, it was hard work yet a celebration at the same time. Looking forward to the sweetness maple syrup and its products would bring to their lives was a big part of pioneer and Indian worlds back then. Many people have been using maple syrup and maple sugar as an organic sweetener for years while others are just discovering the benefits of such as an organic food which has become so popular and accessible in recent years.